We live in Tick Central here in Missouri. I thought it was bad in New Hampshire and Vermont, but it is a million times worse here. I have tried everything, and the only thing that works reliably for us are the Seresto Collar for Large Dogs, by Bayer . Yes, I wish there was an organic method that worked, but if there is, I haven’t found it. Anyway, they work. However, I find them flimsy, ugly, and expensive. I don’t know if it’s just the way my dogs play, but they constantly got quite literally ripped off. At $35 a pop, I can’t just replace them all the time. They are supposed to last months, and when I could keep them on the dogs, they did. I wanted some sort of collar that would hold them, to give them more strength, and this is what we came up with. 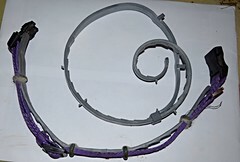 Frank used a tool called an emasculator or bander (Neogen 2008 Econo Castration Bander ) to attach the Seresto collar to their regular collar with the little rubber bands. It works really well. I have to attach the collars a little more tightly than I did before, but that’s the only downside. And as a bonus, the large size has enough material for two dogs, making it much more affordable. To explain that photo a bit — the top gray collar is the Seresto collar itself, right out of the box. The purple collar below has half of the collar attached to Stina’s regular collar. 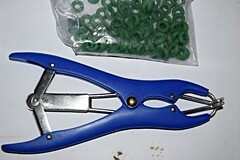 The tool and little rubber bands are pretty cheap — around $12. And by being able to get two collars from one, that’s another huge savings.